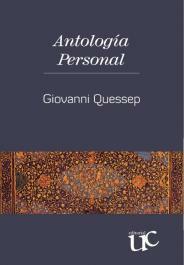 Giovanni Quessep has written the most intensely lyrical poetry in Colombia in the last 40 years. He has always realized that his vital parable was linked to the act of interpreting the mystery of beauty as a song and deprivation in the order of the word. He has written a meritorious work for the literature in Spanish speaking countries. Some of his poems have been translated into different languages: French, Portuguese, Italian, English, Arabic and Greek. In his universal work there is a Ariadne’s thread, that organizes and gives meaning and it is the Quessep’s commitment aesthetic with beauty. His position has been insular. By understanding very early that his destiny was linked with a kind of priesthood and worship of the noble and serene, he has not allowed the spirit of the new influence his conception of poetry. Giovanni Quessep was born in San Onofre, Sucre, December 31, 1939. He studied philosophy and literature at the Javeriana University, and in Renaissance poetry Italy specialized in and Lectura Dantis. A Professor of Literature at the University of Cauca, an institution that awarded him the title of Doctor Honoris Causa in arts in 1992.